Melton Classics has the widest selection of porch columns in the industry. It doesn’t matter what kind of porch columns your project calls for because our design and material selections are endless. We have the best selection of porch columns in the US in virtually every design style you could dream of. Whether your porch project calls for decorative porch column covers or load bearing columns there is no better manufacturer than Melton Classics. Visit Melton Classics and check out our affordably priced options to enhance the architectural style of your new porch. Our porch columns specialists have years of training from working with architects, designers, contractors and homeowners. Our specialists will help you find best design and product that will work best for your individual project. From day one, you will be assigned an experienced specialist to assist you with product selection, quotations, and installation details of you porch columns. We have a Column Selection Assistance guide for information on the various porch columns and all the important details that will assist you in choosing the right porch columns for you project. Give us a call today at 800-963-3060 and set up a consultation to meet with one of our specialists to review your project. Let us give you a quotation on our high quality and affordably priced columns. If your front porch is going to be designed with a classical touch, Melton Classics has the columns that will lend themselves perfectly to your design. Our classical line of columns are based on the timeless Orders of Architecture set down by the famous Renaissance architect Vignola. Our porch columns classical designs are true to the Tuscan, Doric, Ionic, and Corinthian designs. 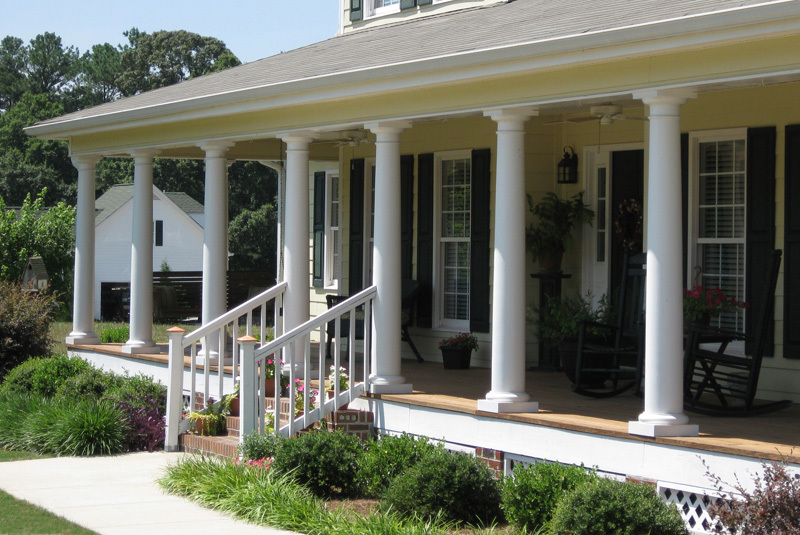 Melton Classics porch columns are available in round column and square column styles. Each porch columns design is authentically crafted with classical entasis taper, and historically accurate classic details to give your home the exact feel that you’re aiming for. Along with porch columns we provide an array of matching pilasters and balustrades to further compliment your architectural style. Melton Classics also offers a selection of low maintenance polyurethane millwork and mouldings which are pre-primed.